Was really expecting it to be much much worse that its been so far. We live by a river and its not that uncommon to have to put the wellies on to walk around the house when we get more than 50mm in a day but so far the river is still well between its banks despite Met Éireann forecasting more rain in a day than we have ever experienced in 15 years. I'm not saying its the same for everyone but we seem to have dodged a bullet here on the coast in Waterford. It has been relatively dry in the last month so that will have helped. 2 cars stuck in floods from Crookstown to Beal Na Blath too. I travelled along that road on my way home at around 3.45pm and while the river was overflowing its banks and there was a lot of surface water, the road was passable with due care. I guess the floodwater had receded in the meantime. Finished off with 9mm more a total of 93mm since Saturday evening. Wow! Is that a tipping bucket? 46mm at Waterford City Weather now. 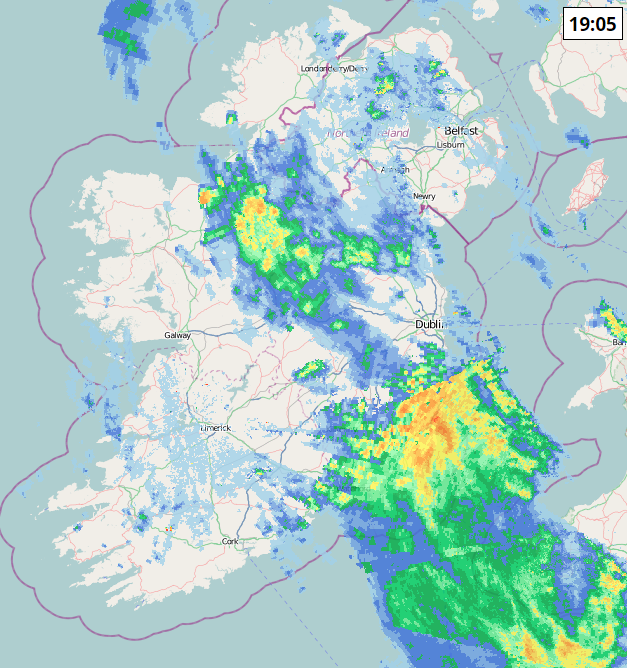 The rainfall appears to be finally clearing from my area of west Cork. It has been a thoroughly miserable past 48 hours that would not have been out of place in mid winter. Not just the rain but also the cold easterly wind that we have had for the last few days. The forecast good weather up to and over the Easter weekend will be much needed to dry out the ground after the deluge. Got off light here near Tralee with just 8mm since midnight . Will be interesting to see the totals . Still getting fairly heavy rain over the SE it seems. Cork Airport got 63mm from 18.00 Sun to 18.00 Mon. Roches Point 56 mm for same time span. Last edited by Meteorite58; 15-04-2019 at 19:32. Yeah and as I pointed out yesterday... the areas left out from ME's rainfall warnings. Would imagine this will stay flooded for a few days with the run off. By 10 pm all was quietening out here at last. TS Eliot's words come to mind..